The first “clearing house” for human genetic diversity data was established in 1951 in a small building at the back of the Royal Anthropological Institute in Bedford Square, London. There, at the Nuffield Blood Group Centre, a librarian, clerk, and statistician collated and ordered a vast paper archive of blood-group data, overseen by Arthur Mourant, a hematologist affiliated with the World Health Organization (WHO). At the time, blood groups were one of the very few human traits with clear genetic inheritance, and blood-group data was being abundantly produced in the context of blood transfusion. The humble setting of Mourant’s clearing house belied its lofty ambitions. Announcing the new Centre, the U.S. magazine Science News-Letter claimed that blood-group data would offer nothing less than a new way of understanding human history and diversity, revealing “the genetic relationships of different groups of people” and making visible the “past nomadic wanderings and migrations of early human tribes over the face of the earth” (Science News-Letter 1951:237). The anthropological journal Man added that such data had the potential to reveal “anthropological element[s]” of disease causation and that the Centre would make an important contribution to medical research (Man 1951:154). To accomplish this, the workers at the Blood Group Centre standardized and computed not only data gleaned from Britain’s National Blood Transfusion Service, which had more than a million registered donors on its books, but also blood-group data extracted from published and unpublished results sent in by doctors, transfusion workers, and missionaries around the world. 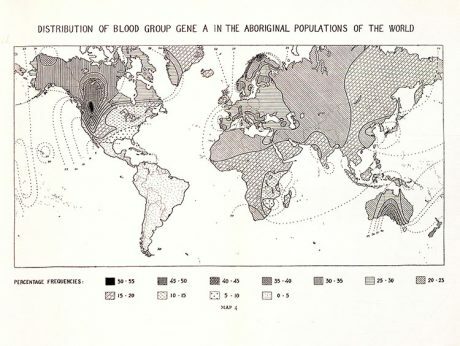 The Centre’s first major volume—an atlas of human genetic diversity called The Distribution of the Human Blood Groups (1954)—represented data collected from more than 50 countries (Figure 1). Figure 1. One of nine fold-out maps in Arthur Mourant’s The Distribution of the Human Blood Groups (1954), indicating the world frequency distribution of Rhesus blood-group allele C. In mapping the heterogeneous and patchy collections sent to the Nuffield Blood Group Centre, the workers there used shading and isolines to indicate a smooth diffusion of genetic variation. Mourant’s archival ambitions were made possible by his practices as head of the Blood Group Reference Laboratory a few miles down the road in the London borough of Chelsea. Blood groups are inferred by testing blood samples against antibodies (antisera) extracted from the blood of human donors; Mourant’s Reference Laboratory made and distributed standardized antisera to hospitals and transfusion centers around the world. Established in 1946 as part of Britain’s peacetime blood transfusion service, Mourant’s lab was designated the central blood-grouping laboratory of the WHO, which Mourant perceived to be a golden opportunity for the large-scale collation of blood-group data. In letters that accompanied bottles of serum to colleagues in his extensive WHO network, Mourant persuaded his correspondents to send to him the results of blood-group tests. He channeled the administrative power of an organization with totalizing political ambitions (the WHO) towards the scientific rearticulation of human diversity in genetic terms. 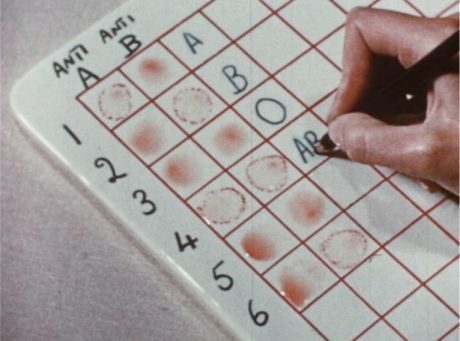 The “wet lab” work of circulating blood samples around the world allowed Mourant to construct the “dry” archive of paper records at the Nuffield Blood Group Centre. The contribution he was making through the expert management of physical samples could be used as a bargaining chip in the collection of “anthropologically” useful data. Although novel in its scope, and in the particular nature of the deal Mourant struck, his dual project put into a formal arrangement a link between human genetic research and the procurement of blood that had been developing for thirty years. Blood transfusion had first become an indispensible surgical practice during the First World War, when techniques for preserving blood had made possible its transfer between bodies. When the war ended, increasing demand for blood forced hospitals to develop strategies for recruiting and managing donors. In some places, hospitals and private agencies paid “professional” donors high prices for blood; in others, organizations such as the Red Cross carefully fashioned donation as an altruistic service (Swanson 2014). Everywhere, transfusion produced an expanding bureaucracy to ensure a reliably supply of blood. Figure 2: Blood groups are determined by testing an unknown blood sample against specific antisera. It was in this (still fragmented) bureaucracy that the ABO blood groups (Figure 2) accumulated as written objects of record on donor lists and cards. Their availability meant that geographically specific blood-group frequencies joined skulls and skin in hundreds of studies of racial, religious, and national differences (Schneider 1996). But blood group documentation also produced novel kinds of research. Blood groups had simple inheritance, donor records were discrete and mobile, donor lists could be collated and reproduced, and “populations” of blood groups could be summarized and repurposed. A small group of researchers intent on remodeling genetics as a population science used these properties to turn blood groups into genetic objects. To British scientists R. A. Fisher and J. B. S. Haldane, who were developing theoretical models for explaining evolutionary change through gene dynamics, blood-group data produced a vision for how these practices might be applied to human heredity. They believed that blood-group data would transform a field concerned with the inheritance of rare complex diseases into a science of large quantities of data and rigorous mathematics, thereby producing a firm basis for curtailing the propagation of genetic disease in future generations (Mazumdar 1992). This was to be—as Fisher put it in a grant application to the Rockefeller Foundation in the mid-1930s—a “solidly objective” human genetics under “strict statistical control” (Fisher 1934). The brutality of the First World War had made people into resources for procuring blood, but the Second World War produced the conditions for the large-scale, centralized management of donors, which in turn became a plentiful resource for geneticists. The transformation from a local to nationwide transfusion service was particularly dramatic in Britain: during the first few months of the war, fragmented donor lists were brought together and remodeled within the country’s first national health service, the wartime Emergency Blood Transfusion Service (EBTS). To the British government, a nationwide service for distributing disembodied blood was an essential line of defense against new technologies of aerial bombardment. And when the EBTS was established, blood donation was consciously repackaged as a contribution to the war effort (Whitfield 2013): enrollment cards proclaimed, “your blood can go on active service”. It was a phenomenally successful campaign. Barely two months after recruitment began, The Times announced that the service had registered its first 100,000 donors (1939). This offered the potential for quantities of genetic data on a hitherto unimagined scale. Fisher’s and Haldane’s vision for human heredity research continued to grow. For instance, when war broke out, Fisher’s lab was co-opted by the Medical Research Council and turned into the central blood-grouping laboratory for the EBTS. He took that opportunity to use the lab’s contacts with depots across the country to acquire hundreds of thousands of donor records as a resource for mapping the genetic diversity of the British people, a precursor of Mourant’s later, international project. In the years following the end of the war, Britain’s Ministry of Health attempted to standardize—right down to the level of typography—the management of blood and people (Figure 3). As transfusion was scaled up, more and more blood groups were discovered, and the specificity of blood became a new focus of bureaucratic concern. With so many people on its registry the new, peacetime National Blood Transfusion Service had reliable supplies of the common blood types, and it became increasingly focused on donors with unusual blood. 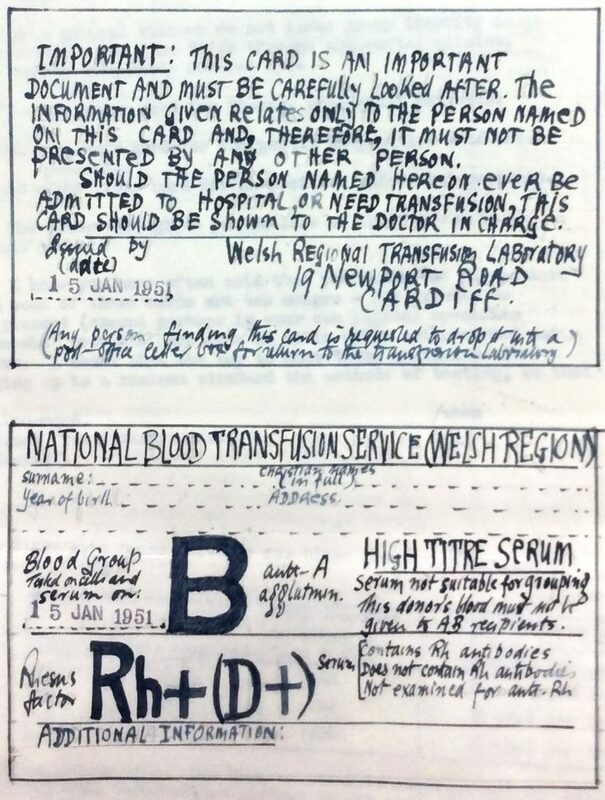 While the “search for rare blood” became a dramatic narrative theme in films, plays, and newspaper reports, Arthur Mourant—by then one of the principal authorities within the transfusion service—oversaw the production of a new bureaucratic technology: a nationwide “rare blood panel” comprising a list of 2,000 donors with the rarest blood types. If a hospital anywhere in the country needed rare blood for a patient, it would telephone Mourant’s laboratory in London and consult the nationwide panel for a match. Only with large numbers of registered donors in a standard nationwide service was the specificity of rare blood made visible. Figure 3. A suggestion submitted by the Cardiff Blood Transfusion Depot to the Ministry of Health for a new standard design of blood donor cards, January, 1951. National Archives BN 13/65. The specificity of blood types became sharper as the donor registry became larger. Whereas in the 1920s a person could be A, B, AB or O, by 1950 a patient could be identified by six separate blood-group systems, of which perhaps only the Rhesus system has joined ABO in the popular understanding of blood. Mourant used this increased specificity in his anthropological archive: the greater the quantity of data he could accrue, the more detailed his geographic maps of human genetic diversity. The WHO’s ambitions to connect up and standardize transfusion services around the world gave him reason to believe that the data could be collected in perpetuity. Moreover, the vastness of the collection would guarantee its own objectivity. Mourant himself admitted that he could not attest to the trustworthiness of many of his correspondents, but he judged that it was more important to encourage the free sending of data than it was to be too picky about technique, and reasoned that any errors in this heterogeneous collection would be swamped as long as he was able to collect large enough quantities of data. Even with data comprising tests on two million people, Mourant believed the collections had to continue. UNESCO endorsed the value of blood-group–based population genetics to an international public in a high-profile campaign to undermine racial prejudices (and assert its own universalizing authority) through the dissemination of “scientific facts.” Launched in the late 1940s, the race campaign was premised on the notion that a clearer scientific understanding of race among the general public would undermine prejudice. Some UNESCO experts insisted that ‘race’ was, in a biological sense, ‘real’, but that it provided no basis for superiority or prejudice. This strand of the campaign seized upon genetics as a pre-eminent example of a neutral, reforming, universalizing science. Blood-group gene frequencies – the argument went – affirmed the existence of biological differences between human populations, but also flattened and neutralized racial hierarchies: for UNESCO they were the perfect mediators of racial difference. Moreover, the kind of endeavor carried out by Mourant – to map blood-group frequency diversity and thereby produce a picture of human history – was highlighted as proof of the virtues of taking a population-genetic approach to race. Dovetailing with UNESCO’s commitment to “unity in diversity,” the study of human population dynamics promised access to deep commonalities that tied the peoples of the world together (see Jardine, Laemmli, and Kaplan in this issue). This argument was encapsulated in the cover design of UNESCO’s 1952 picture book aimed at children learning in school classrooms, What Is Race? (Figure 4). Figure 4. Cover spread of the book What Is Race? Evidence from Scientists (Paris: UNESCO, 1952). In the 1950s, the wet blood/dry paper dichotomy began to break down. In the middle of that decade Danish physician Knud Eldon invented a technology that combined blood with paper. 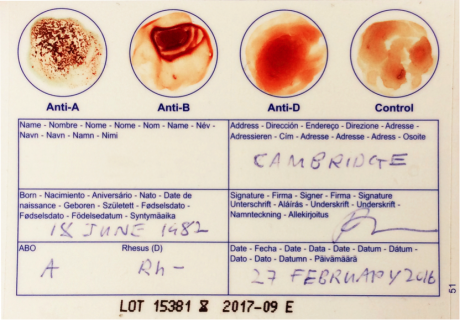 Blood grouping using ‘Eldon Cards’ involved applying blood samples directly onto a card impregnated with antibodies. With an agglutination pattern preserved on the card itself, it could be filed as a true and original permanent record. Eldon Cards were highly controversial: many doctors believed that the “apparent simplicity” of the cards would have “disastrous” consequences for patients, yet they would continue to be marketed for use in domestic settings (Figure 5). More widely enduring was the ‘Guthrie’ card, invented in the early 1960s by US clinical microbiologist Robert Guthrie for testing newborns for the genetic condition phenylketonuria. Today, Guthrie Cards are still routinely used to collect the blood of newborns for an array of protein and genetic tests. Despite restrictions on the length of time cards can be kept, their superlative archival qualities are being affirmed by new research programmes to repurpose the paper-based blood spots. 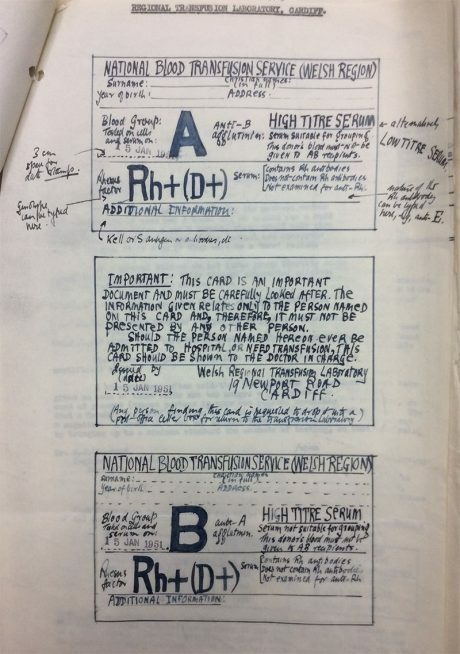 By preserving blood on paper the Eldon and Guthrie cards both offered an authentic record of the biochemical specificities of blood and gave it new archival possibilities. Figure 5. Photograph of an Eldon Card purchased on Amazon, February 2016. The test card comes with a plastic cover that can be applied once the card is dry, preserving the agglutination pattern. Pointing to the market for such tests, the same Amazon webpage listed a range of blood-group diet guides under the heading ‘Customers Who Bought This Item Also Bought’. In the 1960s several other technologies further disrupted Mourant’s wet/dry economy. First, blood was refracting into an array of new protein polymorphisms: techniques such as gel-electrophoresis (separating proteins using an electrical charge) revealed hemoglobin and enzyme variants that were, like blood groups, genetically inherited. Human chromosome preparations—also made from extracted blood—gradually became a compelling new area of research. Second, novel technologies of cold storage that made possible a new material form: the freezing of blood samples. Whereas in the 1940s blood-grouping tests had been possible only on freshly extracted blood, now protein polymorphisms could be resolved from freezeable samples (Radin 2014). And not only known genetic variation: frozen serum was stable enough to be kept for genetic tests that might be discovered in the future. Whereas Mourant’s wet/dry bureaucracy had attempted to manage an ever-increasing store of one kind of information, now blood itself, with its apparently unlimited potential, could be archived in frozen form, prompting enterprises such as the large-scale blood collection projects of the International Biological Programme (Radin 2013). Through cards, freezers and new genetic markers the anthropological quest for genetic diversity data began to diverse from the medical pursuit of stable and reliable supplies of blood. The combination of wet and dry scientific administration that Mourant made so productive in the early 1950s captured a particular moment of alignment between wartime regimes of blood donation, postwar internationalism, and a population genetics promoted by reformists and technocrats. But several features of the postwar moment have endured. One characteristic of Mourant’s enterprise that has persisted to the present day—and which has only expanded its persuasive power—is the justification of studying population differences as a way of better understanding disease. From the HapMap project to the Indian Genome Variation Consortium to the Mexican Genome Diversity Project: initiatives to collect blood for mapping human variation have promised powerful insights into disease causation. Related, large-scale genetic mapping projects project a notion of ‘world citizenry’ that echoes UNESCO’s 1950s endorsement of genetics (notwithstanding deep present-day concerns about who benefits from such research). Finally, in spite of the severing of the institutional and infrastructural ties between transfusion and genetics, these enterprises remain linked through the social practices of donation. Civic commitments to community and nation have long been coupled to cultures of therapeutic donation, and for some these remain the framework within which blood donation for genetic research is understood (Reddy 2013). The kinds of civic responsibility that engender blood giving for genomics are still shaped by ties to community, nation and humanity that were forged through blood. Fisher R.A., “To O’Brien,” July 18, 1934, 01.0001/401A/Box 16, Rockefeller Archives. Man. 1951. “Blood Group Research: Nuffield Foundation Grant to the Royal Anthropological Institute.” 54:154. Mazumdar, Pauline. 1992. Eugenics, Human Genetics and Human Failings: The Eugenics Society, Its Sources and Its Critics in Britain. London: Routledge. Mourant, Arthur. 1954. The Distribution of the Human Blood Groups. Oxford: Blackwell Scientific Publications. Radin, Joanna. 2013. “Latent Life: Concepts and Practices of Human Tissue Preservation in the International Biological Program.” Social Studies of Science 43:484–508. ———. 2014. “Unfolding Epidemiological Stories: How the WHO Made Frozen Blood into a Flexible Resource for the Future.” Studies in History and Philosophy of Biological and Biomedical Sciences 47:62–73. Reddy, Deepa S. 2013. “Citizens in the Commons: Blood and Genetics in the Making of the Civic.” Contemporary South Asia 21:275-290. Schneider, William H. 1996. “The History of Research on Blood Group Genetics: Initial Discovery and Diffusion.” History and Philosophy of the Life Sciences 18:277–303. The Science News-Letter. 1951. “Map Man’s Blood Groups.” The Science News-Letter 59(15):237. Swanson, Kara W. 2014. Banking on the Body: The Market in Blood, Milk and Sperm in Modern America. Cambridge, MA: Harvard University Press. The Times. 1939. “News in Brief.” The Times, August 12, sec. Col. C.
Whitfield, Nicholas. 2013. “Who is My Stranger? Origins of the Gift in Wartime London, 1939-45.” Journal of the Royal Anthropological Institute 19:S95-S117.